Michael McFadyen's Scuba Diving - The Tunnel On the South Coast of NSW there are hundreds of great dive sites. Off Batemans Bay there are dozens of excellent dives, on of which is The Tunnel. Located to the immediate south of Black Rock, The Tunnel is a reef that drops from 9 metres down to a sandy bottom at 21 metres interspersed with small boulders covered in kelp. 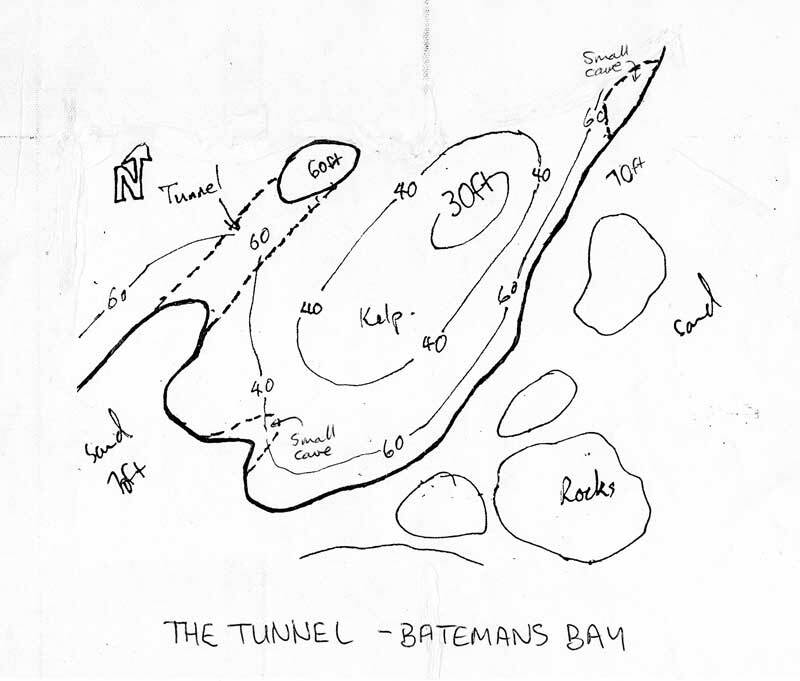 The dive boats used to normally anchor on the ridge to the east of the main part of the dive site (See diagram below). The GPS reading for the site is 35° 46' 52"S 150° 14' 50"E (using AUS66 as datum - if you use another, see my GPS Page. Once in this area, line up the right side of the glass fence to the left of the boat ramp with the right side of the northern most rocks at the entrance to the bay immediately to your west. Run in or out till the left side of Black Rock lines up with the western end of the headland behind. This is as per the drawings on the left. The depth will come up from 20+ metres to about 9 metres, anchor here. Once you descend, a swim to the west or south will bring you to a wall of rock that comes down to the sand. Here you will find the depth is 21 metres. There is a small cave here. Follow the wall to the west and it will soon turn to the north and you will see why this site got its name. On both your right and left the reef wall is almost vertical and resembles a cutting on a train line leading into a tunnel, hence the name. Proceed through the cutting and the sand comes up to 18 metres as you enter The Tunnel. The Tunnel is quite long, perhaps 15 to 20 metres. It does not come to a dead-end but it exits into a vertical hole that ascends to the top of the reef which is about 12 metres. The floor of the tunnel is a slatey/large pebble bottom. You can either return back through The Tunnel or you can go over the reef back to the wall. I suggest that you go up the hole and swim to the east where you will see the shallowest part of this reef (nine metres) before you drop over the wall back to 21 metres. Follow the reef to the south. As you reach the corner of the reef there are a lot of big boulders off the main section of the reef. Under one of these rocks when I dived here in October 1994 there was a baby eastern blue devilfish that was only 150mm long. The best thing though, was that the devilfish was tame and would feed out of your hand. Brilliant, considering that devilfish are normally one of the most shy fish you can ever see in the ocean. There was also another similar fish to the south-west of The Tunnel but I could not find it at the time. On my most recent visit in October 1996 I could not find either fish, but I believe that the first mentioned on is still around. From here swim back past the spot where you probably first met the wall. There are some brilliant marine growth in this area, especially on the low rocks under the wall overhang. After this, go across the cutting to the other vertical wall. You can follow this to the south and then west a bit. There are some nice gorgonias, sea squirts and sponges in this area. As well, the vertical walls of the cutting contain some very colourful gorgonias. Like the other dives around Black Rock, the reef is composed of igneous rocks which are covered in a fantastic purple growth. Another great dive, with the brilliant colour of algae (red, orange and yellow), gorgonias (red) and various sea squirts on the rocks, quite good fishlife, especially in the cutting and The Tunnel, and extraordinary terrain. Not sure who you can use to dive this site now as the operator I used closed up but perhaps the one in Batemans Bay goes there.